On my 1st and last stop at Tasty Dog on Lake Street in Oak Park, I ordered a dog with everything, luckily I caught the guy as he was about to squeeze that red bottle on my dog. stevez wrote: I was on the go today and needed to eat quickly. I found myself downtown headed for the Expressway, so I decided to pull into the Portillo's drive thru on Clark and Ontario for a Polish. Now, Portillo's has never been my favorite place for getting a polish, but I thought they did at least a serviceable job. Today, they completely insulted me and every Chicagoan by serving a "Maxwell Street Polish" (grilled polish, grilled onions, sport peppers and mustard) on a piece of Gonnella bread, not a poppy seed bun. What the F**K is up with that? They are giving tens of thousands of tourists the wrong idea of what this Chicago classic is supposed to be...not to mention throwing off the taste/texture profile of the sandwich. It's just shameful. I'm with you on the softer bun to feel the "snap", although I'm no fan of poppy seed buns in general (I prefer sesame seed). But adding sport peppers is also changing the "Original Maxwell St. Polish". Is it not? And again, I'm a big fan of the added sport peppers. It just seems like they are both just variations on a theme. Count me as one Chicagoan who doesn't feel insulted. A real Chicagoan oughta have a thicker skin. They should just give people a choice of buns, so that each eater can have their sandwich the way they'd like. YoYoPedro wrote: But adding sport peppers is also changing the "Original Maxwell St. Polish". Is it not? YoYoPedro wrote: They should just give people a choice of buns, so that each eater can have their sandwich the way they'd like. I agree. and it would be easy to do. It's two different items. One is a "Maxwell St. Polish" and the other is a polish on Italian Bread. I guess, like everything else in life, there are conflicting opinions, and everybody has one. You'll probably stick to yours, and I'll probably stick to mine. My idea of a Maxwell Street Polish is a crispy cooked (deep fried is best) Polish sausage (with those fine diagonal scorings through the casing) on a bun or roll, with mustard and a pile of grilled onions. I like mine with sport peppers. Vienna Beef says sport peppers are part of the deal, but allows a poppy seed bun or "warm roll". ABC7 says steamed buns, no mention of poppyseed, no mention of sport peppers. But their accompanying photo shows what looks like a Gonella-style roll with sport peppers on it. Wikipedia says that it's served on a bun, no mention of poppyseed, and offers sport peppers as an option to "add heat". Life In the USA leaves out the sport peppers as well. AllExperts.com says it's served on a bun, no mention of poppyseed, with sport peppers an option for added flavor. All that really matters is how Jim's serves it. Coarse ground sausage with pork in the mix (all pork? pork and beef? dunno) and a natural casing, grilled on a griddle, with grilled onions, mustard, and peppers optional. Not on an italian roll. gleam wrote: All that really matters is how Jim's serves it. Coarse ground sausage with pork in the mix (all pork? pork and beef? dunno) and a natural casing, grilled on a griddle, with grilled onions, mustard, and peppers optional. No poppy seed bun at Jim's, according to the guy that just answered the phone there. He said that he'd be happy to do a Maxwell Street Polish on a roll like an Italian beef comes in, but he doesn't have them. He says that he only has hot dog and hamburger buns there. YoYoPedro wrote: He said that he'd be happy to do a Maxwell Street Polish on a roll like an Italian beef comes in, but he doesn't have them. He says that he only has hot dog and hamburger buns there. Well, stevez is also a fan of the non-jims-style polish sausage, which is what it sounds like what portillo's is serving. This is what CSD described, an adult-spiced jumbo hot dog in a poppy seed bun, grilled or deep fried. This is what most of the dog stands in chicago serve. This arguing is for naught. If it's not made and served on Maxwell Street, then it's truly not a Maxwell Street polish, and all bets are off. saps wrote: This arguing is for naught. So the Maxwell Street Polish is just a part of Chicago history? We have to call them Union Street Polish now? The dude cannot abide. gleam wrote: Well, stevez is also a fan of the non-jims-style polish sausage, which is what it sounds like what portillo's is serving. This is what CSD described, an adult-spiced jumbo hot dog in a poppy seed bun, grilled or deep fried. This is what most of the dog stands in chicago serve. I hope it's not the "adult hot dog" Polish Portillo's is serving in a Gonella roll--that would seriously be an imbalance in the sausage-to-bread ratio. For the record, there's a place up the street here on Pulaski called Tony's that serves their Polish in an Italian beef roll (at least they did two years ago when I last was there). They don't call it a "Maxwell Street" Polish, just a regular Polish sausage, even though they use the thicker, bigger Maxwell Street style links. I was surprised at the presentation (I had never seen a Polish served that way before), but I have to say, it wasn't bad at all. Personally, I would not have been offended if they did call it a Maxwell Street polish--I use Maxwell Street to mean the thicker type of Polish sausage, smothered with grilled onions. The bun is not a consideration in my definition. A Chicago Polish is a big brother to a hot dog. The Maxwell Street version is larger, spicier, and greasier than a hot dog and has a natural casing. It's grilled or deep fried, rather than steamed or boiled. The original version was topped with mustard and onions and served on a plain hot dog bun. Later versions were served on a steamed poppy seed bun with sport peppers. Someone down the line used Dusseldorf mustard in place of yellow mustard. Now many stands do their own thing. YoYoPedro wrote: A real Chicagoan oughta have a thicker skin. Do you mean natural casing? Hehehe. One could have some fun here, but it IS a family-friendly board. Actually, I had been thinking that instead of calling a Maxwell Street Polish the "big brother" of a hot dog, I'd call it more of an uncle. You know, the thicker, greasier, spicier uncle with the gold chains and the big old Cadillac convertible, who likes to drive out to Vegas to gamble. Kinda always smells like onions and always pulls a dollar off a big fat roll in his pocket to hand out to the nephews? Call it "The King," like Elvis. Hot Doug does. On a warm day, you can still smell the grilled onions on Maxwell & Halsted. wait a second! shouldn't we debate the degree to which the onions are grilled????? A sloppy, greasey, oniony mess is all fine and dandy, but a Maxwell Street Polish should have sliced, never chopped, onions that are grilled 'til they just start to caramelize for a slight sweetness. We need to settle this issue or this city is headed for a disaster of biblical proportions. Human sacrifice, dogs and cats living together - mass hysteria! Kitchen Monkey wrote: wait a second! shouldn't we debate the degree to which the onions are grilled????? I have no opinion whatsoever on what constitutes an authentic "Maxwell Street" polish sausage, but I will say that I was very disappointed with the polish I got a week or so ago from a suburban Portillo's location. The sausage was overcooked and a tough chew, no juiciness left at all. And it was served on one of those Gonella bread rolls instead of a hot dog bun, which I did not expect. Now, I don't mind one of those chewy rolls at all for a different kind of sandwich, when I know what I'm getting. But I didn't know my polish sausage was going to come on that. Between the tough bread and the tough meat it all was too much of a workout to eat, and I didn't enjoy it at all -- which is saying something, since polish sausage is my favorite fast food sandwich. Next time I'm at Portillo's I will make a point to ask if it's possible to get a bun instead of a roll, and also ask that they cook me a fresh polish sausage, rather than one that's been sitting off on the side of the grill drying up all evening. KM, not only should the onions be grilled, they should be carmelized in butter with a pinch of sugar or some Coca Cola added for the extra sweetness factor. This is how they were prepared on Maxwell Street when I was a kid in the late 40's/early 50's, living on Roosevelt & Keeler. Make mine well done, please! Mmmmmmmmm!!!!!!!!! I've got a new desktop background! Katie wrote: I have no opinion whatsoever on what constitutes an authentic "Maxwell Street" polish sausage, but I will say that I was very disappointed with the polish I got a week or so ago from a suburban Portillo's location. The sausage was overcooked and a tough chew, no juiciness left at all. And it was served on one of those Gonella bread rolls instead of a hot dog bun, which I did not expect. Now, I don't mind one of those chewy rolls at all for a different kind of sandwich, when I know what I'm getting. But I didn't know my polish sausage was going to come on that. Between the tough bread and the tough meat it all was too much of a workout to eat, and I didn't enjoy it at all -- which is saying something, since polish sausage is my favorite fast food sandwich. Next time I'm at Portillo's I will make a point to ask if it's possible to get a bun instead of a roll, and also ask that they cook me a fresh polish sausage, rather than one that's been sitting off on the side of the grill drying up all evening. I had that same experience from the Portillo's near Old Orchard on Skokie Boulevard. I was totally expecting the soft non-poppyseed bun from Jim's Original, and was shocked to receive a Gonella roll instead. Quite a letdown, beyond the qualitative difference in taste from Jim's. At any rate, I suppose it would be good to expand my Polish horizons (of the bigger, Maxwell Street-size variety). Can anyone recommend an excellent example of the poppyseed style on the far-North Side/near-north suburbs? Here you can get it char grilled or fried (which is my preference) and all we have is the poppy seed buns. People have asked for it on french bread but that is few and far between. As for the grilled onions, there isn't a big demand so they are made when the order is placed. Now , an old lady that claimed to have worked down on Maxwell Street back in the day told me that the onions were baked, skin on,wrapped in foil then chopped up and finished off on the grill. Take that for what it's worth. Wasn't until a couple years ago, discussing it with my boss, he told me that gribness is rendered & fried chicken fat--schmaltz, as it were. Can't imagine what gribness would go with, or whether it was just to be snacked on, like pork rinds. jnm123 wrote: Wasn't until a couple years ago, discussing it with my boss, he told me that gribness is rendered & fried chicken fat--schmaltz, as it were. Gribbenes are not the same thing as schmaltz. Schmaltz is the fat, gribbenes are the cracklin'. Although, they are closely linked since they're often the product of the same process. Although I'm not sure what "in season" means. If there's a dead chicken to be had, 'tis the season. 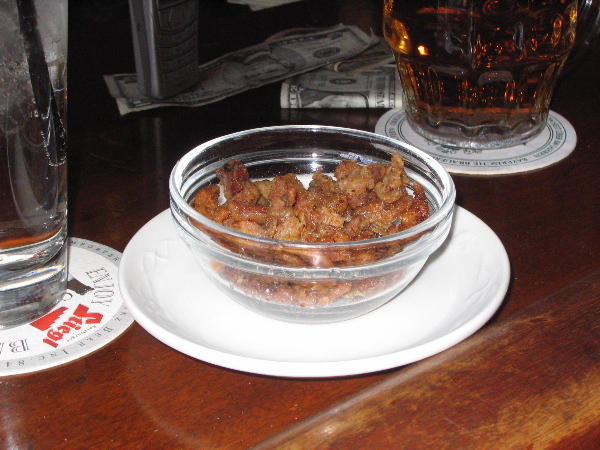 eatchicago wrote: Gribbenes are not the same thing as schmaltz. Schmaltz is the fat, gribbenes are the cracklin'. Although, they are closely linked since they're often the product of the same process. Although I concur with the explanation, in point of fact I have never seen or heard of gribenes (double 'b' spelling typical of Galitzianer heritage, no doubt ) outside the context of schmaltz. You find gribenes in schmaltz; although--in theory--one might find them elsewhere, I have never heard of reality confirming that particular theory.